Keyring Ultraviolet Light suitable for Counterfeit Detection. Batteries Supplied & Fitted (The unit operates by 2 x CR2016 (3v) batteries). Click on guidance images for notes on Forgery detection. Click on the Flatfish Light image to return to the normal page. The Chaperone® Flatfish UV Keyring Torch is perfect for the counterfeit detection of forged banknotes, credit cards and important documents. The light is battery powered for ease of use and is fitted to a keyring for total mobility. The LED bulb will last a lifetime and the UV light as a whole comes with a 12 month guarantee. This note detector is designed to offer users a simple, quick and easy way to check for counterfeit and forged documents banknotes and credit cards. A quick scan of any note will illuminate the denomination of the note in UV reflection. A forged note will not! £5 Note : Look on the front of the note in the bottom left corner you will see the figure 5 illuminated. £10 Note: Look on the front bottom left of the note and you will see the figure 10 illuminated. £20 Note: Look on the front in the middle at the top of the note where the figure 20 will appear. Approx. 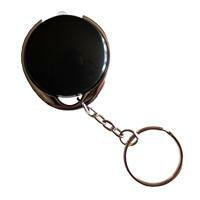 Dimensions: 35mm Diameter (Excluding Keyring). The unit operates by 2 x CR2016 (3v) batteries already fitted.